Patricia Arquette (right) and James Van Der Beek star in CSI: CYBER. ©CBS Broadcasting. CR:Monty Brinton/ CBS. 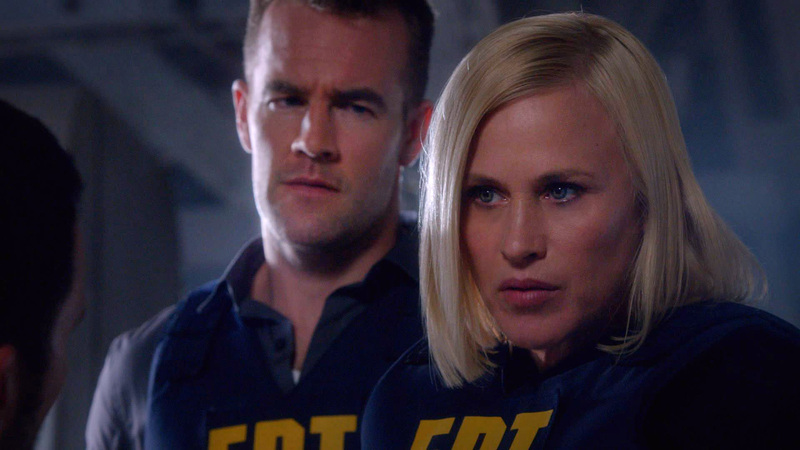 HOLLYWOOD—Fresh off of her Academy Award performance in “Boyhood,” Patricia Arquette now stars in the new CBS drama “CSI: Cyber,” premiering Wednesday, March 4 at 10 p.m. PT/ET. Ripped from the headlines, the series is inspired by the advance technology work of real-life cyber psychologist Mary Aiken. Arquette portrays Special Agent Avery Ryan, the head of the Cyber Crime Division of the FBI, which focuses on solving serious crimes of global proportions by people who hide in the shadows of the Internet. The actress came to the TV Critics tour last month to talk about her new series and coping with awards season. Q: What was it about this franchise or character that persuaded you to do another series? Arquette: First of all, “CSI” is the largest global franchise in the world, so you’re really connecting to your audiences everywhere. But for me, I feel like we’re on the dawn of a new time. This is like the Industrial Revolution. This is an explosion of the way that we’re going to be living our lives. (The “CSI” writers) know how to write things that are entertaining, that it excites audiences. And yet they’re also introducing all this information about these new technologies and the ways that we’re living now, the way that crime is developing. We’ve been seeing cops with guns that were men for over 50 years. So to be a woman in law enforcement on television, I think, is important. It’s a powerful position for a woman to be in. The interesting thing about cybercrime and the whole cyber world is that many of the people that are most proficient in it are really young people. So this particular show has a real mixture of people that have a little more history with conventional crime solving and young people that are geniuses. With all technology, they’re being very specific about letting us see the human side of Avery. This character is based on Mary Aiken. And she helps us so much. But also, it’s its own creature as well. There’s a little bit of a division. So the way I looked at this character is she’s really developed a strong survival mechanism of her mind, profiling people. And she can have empathy for victims, for other people. When it starts getting too close to her, it’s a little uncomfortable territory to not have survival skills, not have a mechanism, not be able to see what the next move is because your emotions override your mind. Q: Does all this talk about the cyber world make your head spin? What are the technical challenges you have? Arquette: It’s hard to get your mouth around some of these words, and I feel like it took me a good six episodes to start getting my mouth around some of them. But for young people, they are so proficient in technology, for the most part. We’re just catching up to them and adding on. So we do want this show to be relevant to them, to be interesting to them and also to parents, to learn how do you keep your child safe? What are the things that are possible right now? What does this new technology actually mean in our lives? Q: How much do you use the Internet? Arquette: I think we all use the Web. We’re all on the surface Web using it all the time, and we think we have some concept about what that is. But we are talking about many things that are happening in the deep Web, and there is a lot happening in the deep Web. And we’re just discovering what it is. It is evolving as fast as law enforcement is figuring it out. Q: Is there a danger in stoking online paranoia or is it the wild, wild west out there that it’s better that people are terrified of what happens when they sit at their computer? Arquette: I don’t think we should hide from it. This is the reality, and it is like an ostrich burying its head in the sand to pretend this isn’t happening. I mean, we may want to question do we have to have every device wi-fi enabled? Do we really have to have our coffee maker wi-fi enabled? We might want to think about the products we’re using and how they can be changed, removing some of those components and keeping them a little more low tech to avoid some of these unnecessary, extra things that are glommed on for convenience, convenience, convenience. It’s pretty inconvenient when you get hacked. So we might want to start thinking about actually buying products, supporting products and companies making products that do keep us a little safer from this. Q: What is it like launching a show at a time when your role in “Boyhood” is so prominent? But I’m so fortunate as an actor to be working; I was raised by a working actor. I’m grateful for work. I’m interested in this subject matter. I like to entertain people. We made this little movie. It’s having incredible reception. I’m very grateful for that. So I just feel like I’m having a beautiful moment in my life; I’m grateful for everything.